Suncoast Print & Promotions, of Sarasota, Florida, has been in business for 38 years, as a full-service print distributorship, specializing in forms, commercial printing and advertising products. With seven presses on site, they're able to print business forms, checks, brochures, letterhead, booklets, envelopes, labels and more, all under one roof. In addition, they've been a Formax reseller for the past 15 years. 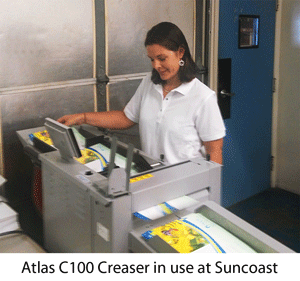 Prior to purchasing the Formax Atlas C100 Creaser, they used scoring machines which didn't provide the clean, professional product their customers were seeking. 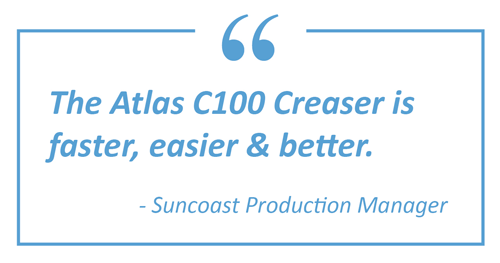 We recently spoke with Matt Clare, Print Shop & Production Manager at Suncoast, to get an idea how the Atlas C100 is improving their finishing processes. 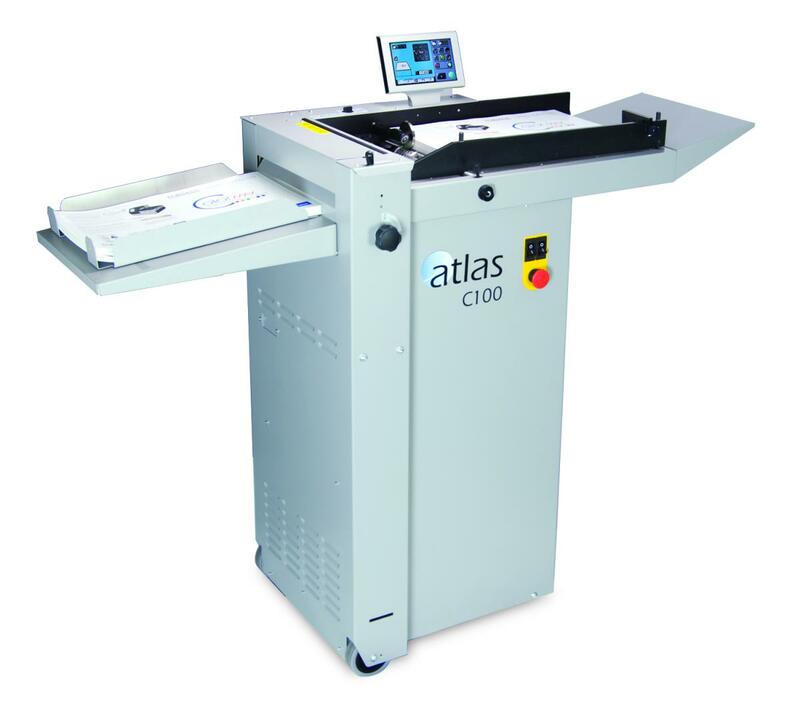 The Atlas C100 Auto-Feed Creaser is a user-friendly solution to the problem of cracking when folding toner-based digital prints. The C100 uses a heavy-duty creasing matrix which compresses and embosses the paper fibers instead of cutting them. With a traditional scoring machine, the circular blades cut the top fibers of the paper, which can result in unsightly cracking of the printed edge.
" We bought the C100 because it's a creaser," Clare said. "We're replacing our scoring [machines]. I haven't scored anything since a week or two after we bought the machine. We crease everything now." Clare said they didn't have a lot of volume for creasing, so they took some time to consider investing in a new machine. "We use it all the time, and we're easily justifying the money we spent on it." One of the best things about the C100, Clare said, is that it's very user-friendly and easy to set up. Simply enter the paper size, the fold/crease type and it creates the settings automatically. For example, he said when processing a job with 250 note cards, "I can have that done from start to finish in 15 minutes or less. In the past, it would take me 15 minutes to half an hour just to get it set up and running." Clare said they're taking on jobs they would never have considered before. These include jobs requiring multiple passes or additional handling which increases cost. "The salesmen are giving me jobs that we used to outsource because they could do a better job than we could. Being able to find other opportunities is great, in addition to the time savings," he said. "I can easily do multiple creases on one sheet in one pass, where in the past I would have had to feed the sheet through my scoring machine 2, 3 or 4 times." Clare said they would definitely recommend the Atlas C100. "We have a much better product now" because of the C100, he said. "The quality of the creasing, as opposed to scoring, is tremendous, especially on digital printing. It's faster, it's easier, and it's better."